Eureka’s new Panther Peak 30L backpack is the perfect size for day hikes from your campsite. The pack is designed for comfort and easy of access to gear, all at an affordable price. 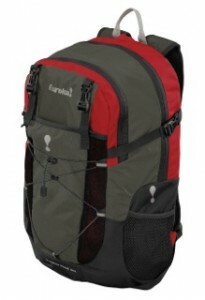 The pack is made from a 420D polyester mini ripstop body with a 600D polyester oxford bottom. It also features a padded and ventilated back panel with 3D spacer mesh, padded hip belts, slide adjustable sternum straps with safety whistles, built-in rain covers, and a boxed and padded hydration sleeve that doubles as a laptop/tablet compartment. The Panther Peak 30L measures (20.5” x 10.25” x 7”) and weighs 2 lbs. 6 oz. It is available in two color combination; Pesto Green/Pirate Black and Pirate Black/Moab Red. At a retail price around $69.99, the Panther Peak is a great way to carry snacks, water and other gear you’ll need for a full day of hiking. For more information, visit www.eurekatent.com.